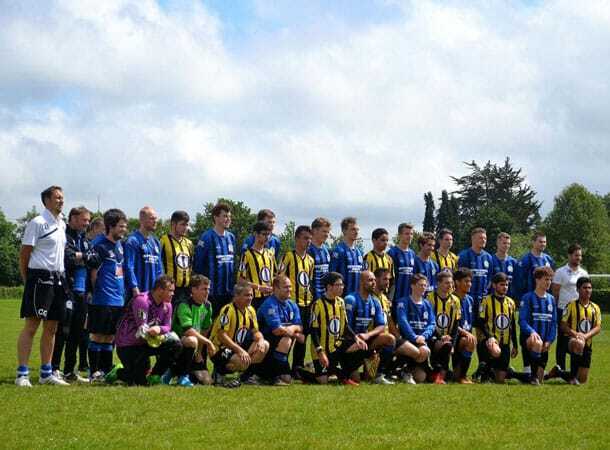 It all started on Friday afternoon 26th May, when the huge bus, carrying 55 French visitors, including the Vimoutiers Football team, got held up for an hour by customs at Portsmouth and eventually arrived at the Fordingbridge Rec field over an hour late, but fortunately on the hottest (and sunniest) day of the year so far. All was well, and they were all introduced to all the host families in Fordingbridge and taken back to their various abodes. 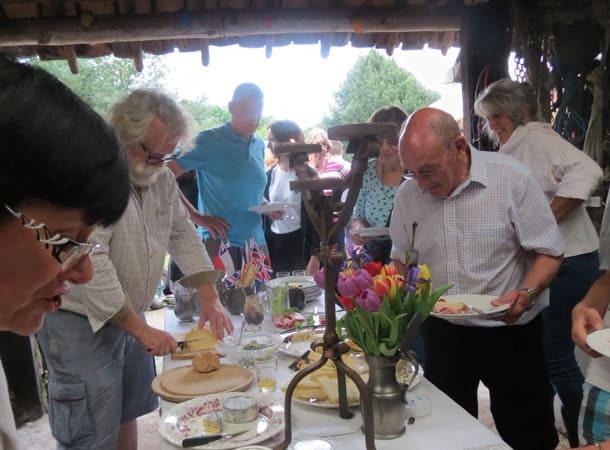 Incidentally, the number of Fordingbridge people who rallied round to offer accommodation for our French visitors was amazing, and we’d like to thank them all, including those who made offers that we were unable to use in the end. 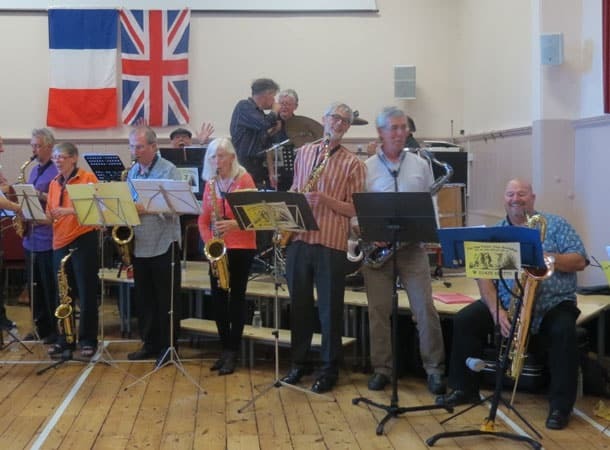 After a quick “wash ‘n’ brush up”, they returned later to Fordingbridge Town Hall for a welcome party where there was food and drink and music delivered by the local Godshill-based “New Forest Jazz Workshop”. 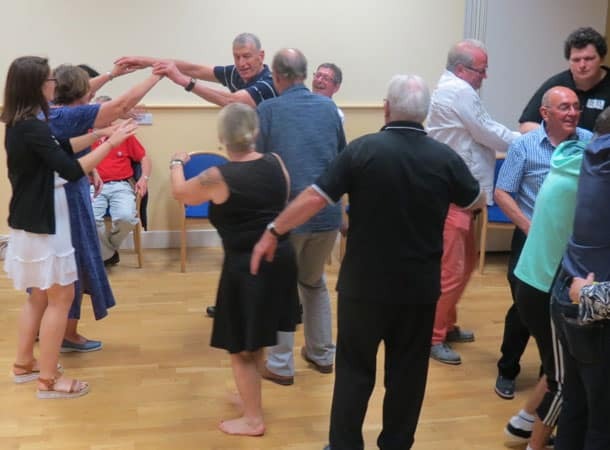 Halfway through the party, the French football team was treated to a coaching lesson, laid on by the “Fordingbridge Turks”, delivered by a guest FA trained football coach. Overnight, a huge rain storm cleared the air, ready for the next day, Saturday 27th May. Saturday morning began with the official ceremony to sign an updated Twinning Charter at 11.00am in the Town Hall, by the Town Mayors and Twinning Associations. National anthems were played by Hyde Band, and an exchange of gifts followed. Lunch was served at Burgate 6th form College, for over 80 guests including 55 French visitors. 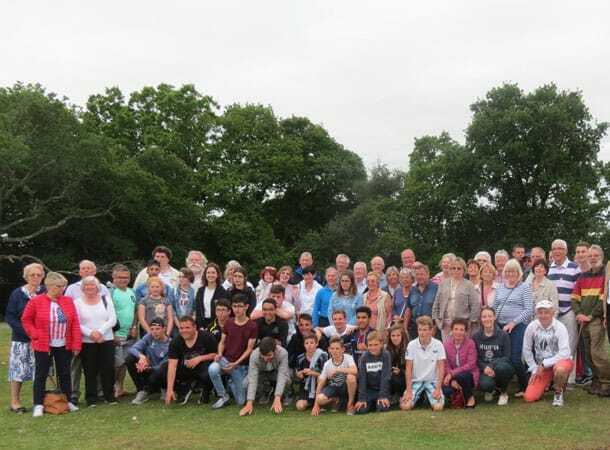 At 2.00pm, the football match began, and in the presence of her daughter, a tree was dedicated to the memory of Madame Germaine Beaugeard who had been instrumental in the establishment of Twinning 35 years ago. 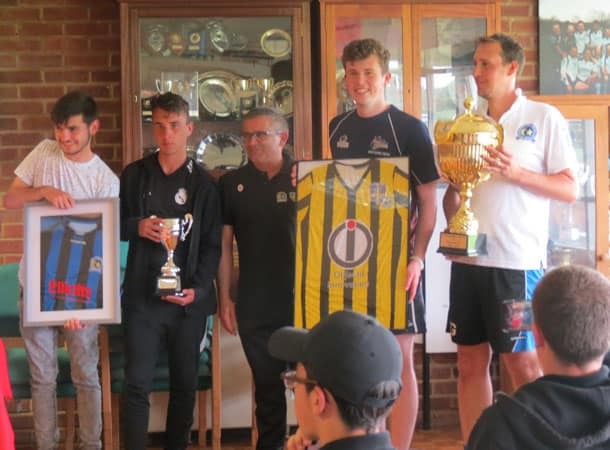 Meanwhile, the Vimoutiers football team presented a souvenir trophy, and the Fordingbridge Turks produced two “Bailey Cups”, two, so that the Vimoutiers Team could take one back to France with them. The Fordingbridge Museum was kept open all afternoon, for the benefit of the visitors to Fordingbridge. Everyone had a break before the Barn Dance and Hog Roast commenced at Avonway Community Centre. 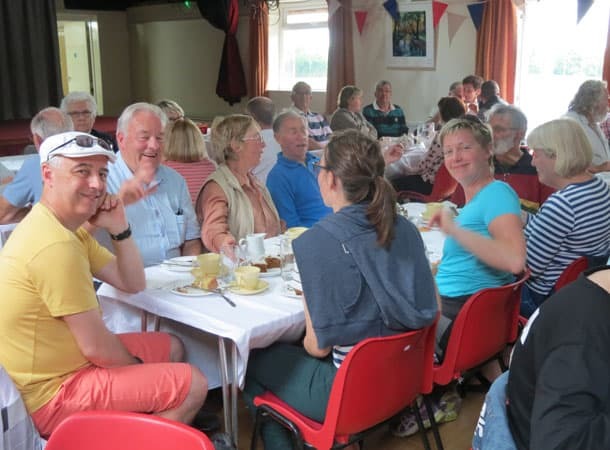 The French visitors were impressed by the hog roast and joined in the Barn Dance and skittles hall. Lynden Bowen did the calling: it was brilliant! 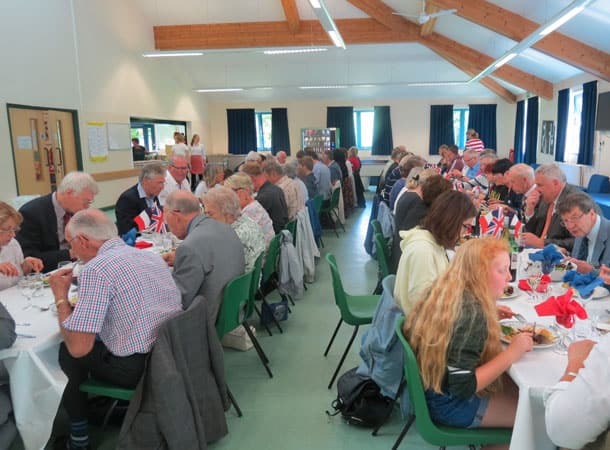 Weather–wise, we had a quiet night Saturday/Sunday, so that the twinning celebrations could re-commence on Sunday morning at St Mary’s Church, Fordingbridge, with a service (in both languages!) 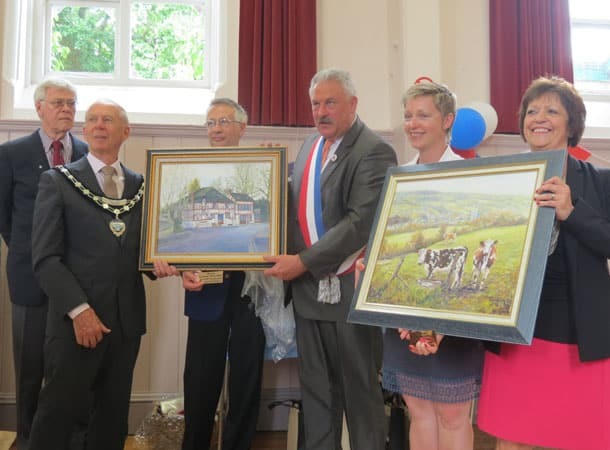 in celebration of “The 35th Anniversary of the Vimoutiers/Fordingbridge Twinning Association”, a specifically conducted service by our very own Reverend Canon Gary Philbrick. 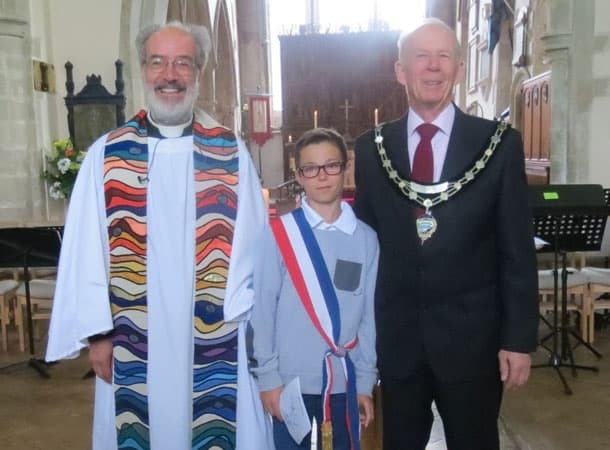 The highlights were the readings, a reading by the Vimoutiers Junior Mayor Louis Catherine (age 10) and the four “prayer stations” whereby all the participants of the service, could mingle and converse with each other. 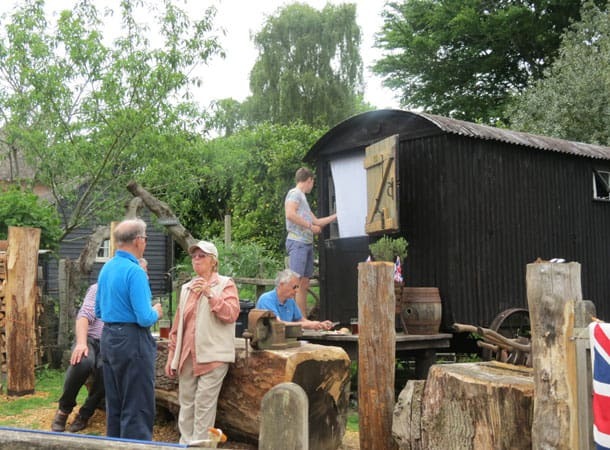 followed by a guided walk across the New Forest, (courtesy of our Chairman, Alison Ayling) and a visit to Godshill Pottery.